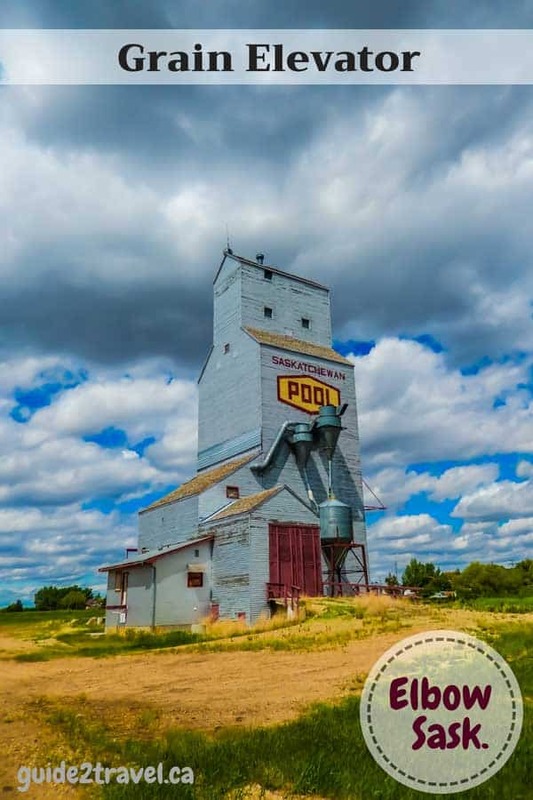 Saskatchewan — 5 Tourist Attractions That Will Surprise You! Discover Saskatchewan off the beaten path! Visitors to Saskatchewan are often looking for the iconic attractions of the province. From the RCMP Heritage Centre at RCMP Depot Division–the training center in Canada for all RCMP officers, to our wheat fields and intriguing skies, there are many things to see and do. Two major highways cross the province, with the Trans-Canada Highway #1 running East and West through the province around a 100 miles north of the U.S. border. The second highway, the Trans Canada Yellowhead Highway #16 cuts a diagonal strip heading North from the eastern side. Both of these highways offer the scenes you’ll expect to find in Saskatchewan, along with the two largest cities: Saskatoon (situated on the South Saskatchewan River) and Regina (the province’s capital). When you leave these two highways, though, you’ll find many unexpected Saskatchewan attractions! Here are some of my favorite attractions in Southwest Saskatchewan. 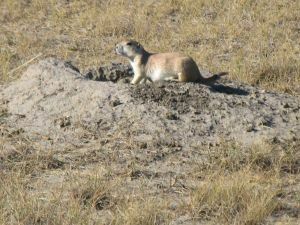 Prairie dog in Grasslands National Park. 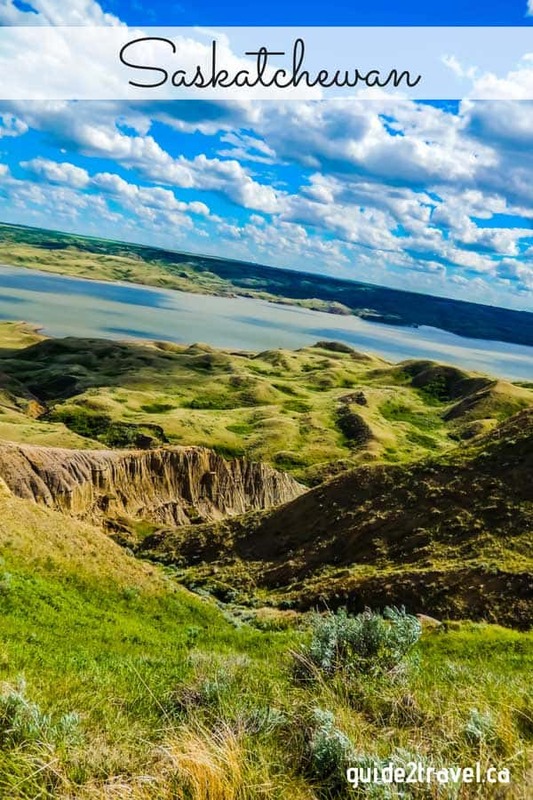 Grasslands National Park provides visitors with a glimpse into Saskatchewan’s past in a different way than you’d expect–it preserves not buildings or artifacts or a way of life, but the land itself. Here you’ll find mixed grass prairie with grasses that have nearly disappeared elsewhere in the province–from spear grass that pokes right through your jeans and socks, to clumps of blue grama grass that bind the prairie together. Along with grasses, you’ll also find wildflowers in every color of the rainbow. Grasslands is also home to many animals and birds that have pretty well disappeared in other parts of the province. Prairie dog mounds dot the park, with hundreds of mounds linked together to form “towns.” My grandson and I watched these little dogs pop in and out of their holes for hours! The park is also home to bison, pronghorn antelope, the fastest land mammal in the western hemisphere, and sharp-tailed grouse, the provincial bird, prairie rattlesnakes, and more. You’ll find more than 12,000 tee-pee rings in the park, plus the park is Canada’s richest resource for dinosaur fossils! Grasslands National Park is 160 km south of Swift Current, which is on the Trans-Canada Highway. 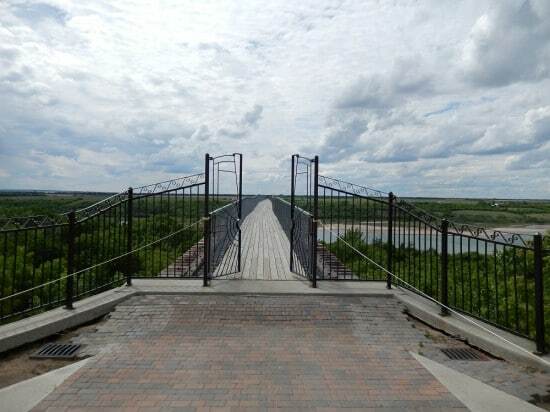 The Sky Trail Bridge is the longest pedestrian bridge in Canada–it crosses the South Saskatchewan River at the town of Outlook. It wasn’t, however, always for hikers, but was built as a train crossing and formally opened a century ago in 1912. The C.P.R. brought the bridge’s piers from Lachine, Quebec, and used them to erect the new three-quarters of a mile long structure at Outlook. Twenty thousand bags of cement later, the bridge had the highest piers in the world (at the time) and was the second largest railway bridge in Canada. Skytrail Bridge at Outlook, SK. Canada’s longest pedestrian bridge. The bridge is currently closed to hikers, so you can’t cross the South Saskatchewan River here. However, you can still hike the TransCanada Trail in the area and get some great shots of it from below. Outlook is 95 km south of Saskatoon (on the Yellowhead Highway). The Cypress Hills are an anomaly on Saskatchewan’s southern prairies–11,000 years ago, at the end of the last ice age, they still hadn’t been covered. They rise 200 feet above the surrounding prairie, to a maximum elevation of 4,816 ft, making the Cypress Hills the highest point between the Rocky Mountains, in Alberta, and Labrador. 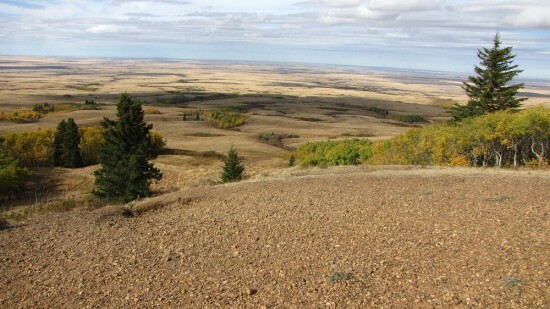 Home to 700 different species of plants and animals, the hills are in the Cypress Hills Interprovincial Park with parts in Saskatchewan and Alberta. You’ll find 14 different species of orchids, the only lodgepole pine trees in Saskatchewan, and one of the highest densities of cougars in North America, among other things! The Cypress Hills Interprovincial Park is also a Dark Sky Preserve, so provides exceptional star gazing opportunities. This attraction is 52 km from Maple Creek, which is just a few miles south of the Trans-Canada Highway. 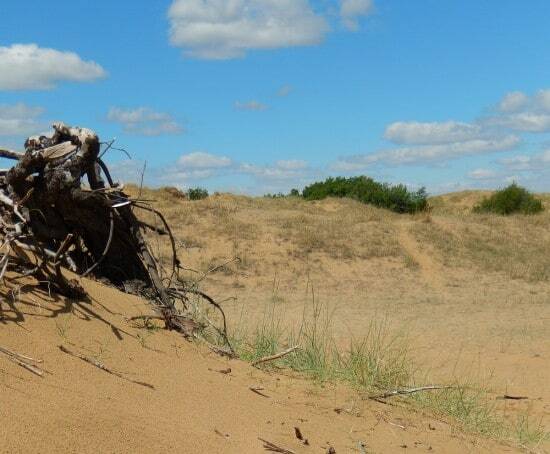 Douglas Provincial Park is home to one of Saskatchewan’s least known attractions, a huge sand dune in the northeast sector of the park that stretches more than a kilometre (2/3 of a mile) in length and rises 30 metres (100 feet) above the prairie. There is one catch to enjoying the dunes, though, which is that in order to maintain the landscape, the only access is by hiking in. Motorized vehicles, such as ATVs or dirt bikes, aren’t allowed. The 5 km hike leaves from the park’s visitor center, taking you through grasslands with poplar trees (also called aspen), saskatoon bushes, poison ivy, and once you get to the sandier areas, some prickly pear cactus. Sand dunes at Douglas Provincial Park. Douglas Provincial Park is 100 km northwest of Moose Jaw, which is on the Trans-Canada Highway. You’ll find lots to do in the park as well as explore the sand dunes, from fishing and boating to bird watching (more than 170 species of birds live here!). The sand castles at Beechy look like a million kids or so have been having a competition building sandcastles on the banks of Lake Diefenbaker. 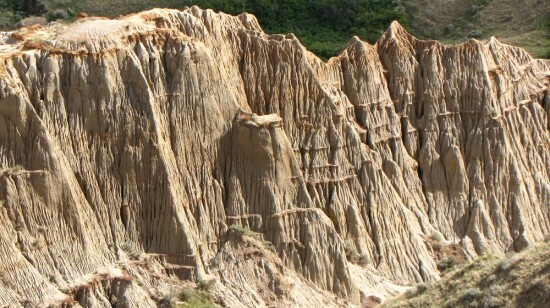 However, according to locals these unique formations have changed little since they were first noticed in the 1990s. I climbed down the steep hills for a closer examination of these castles–it was, I’ll admit, a tough climb when you’re 50+! Although I came away appreciating their beauty, I had no more concrete ideas about how or why these beautiful structures had come to be! Along with the sandcastles, you’ll find a sunken hill, where one side of a grassy hill just slide away, snakebite coulee and a magnesium sulphate lake for attractions. 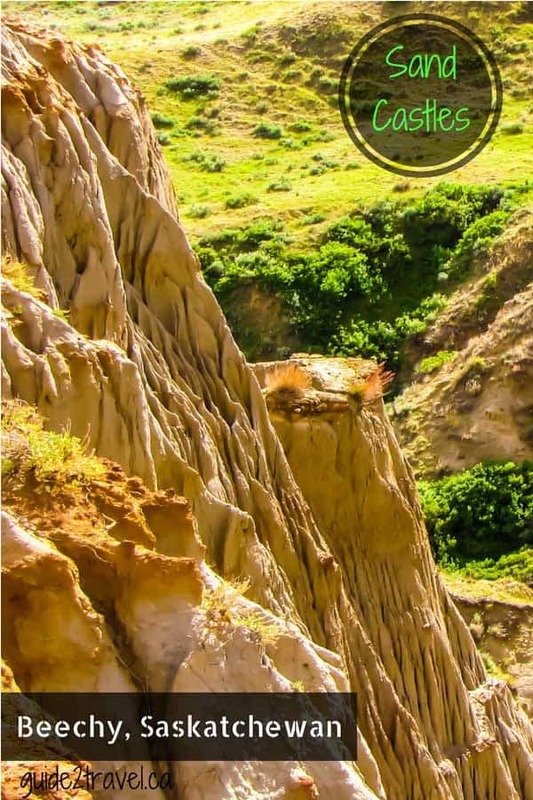 While the easiest way to access the sand castles would be from Lake Diefenbaker, you can get directions from this SaskTourism webpage. There are lots of hiking and photo opportunities at this Saskatchewan anomaly. You’ll find it 126 km northeast of Swift Current, which is on the Trans-Canada Highway. You’ll see lots of big machines on a free Estevan Energy Tour in Saskatchewan — and learn a lot about the province’s energy history. This planning guide will help you select the best places to stay in Regina, Saskatchewan, when you visit, no matter what part of the city, or its key attractions, you plan to see. A traditional English pub was the focal point of community life. Here, you could drink your “pint,” relax and trade stories with friends, even make a deal or two. Saskatoon, Saskatchewan’s popular Winston’s English Pub & Grill captures the traditional pub atmosphere as well as adding its own unique spin on English cuisine. The Moose Jaw River flows through the Wakamow Valley urban park in Moose Jaw, Saskatchewan. It provides 20 km of trails and year-round outdoor adventures. There are lots of rodeo events to see in Saskatchewan every summer! See rodeo bull riding, bronc busting, calf roping and more from June through August. A night out in the historic Hopkins Dining Parlour in Moose Jaw is guaranteed to have a tasty meal — and if you’re lucky, an encounter with a ghost! The photo in the header above was taken at Douglas Provincial Park in Saskatchewan (Canada). Thanks, the article actually tells you that you can no longer hike it — however, the Trans-Canada trail is still open and you can take photos of the bridge.